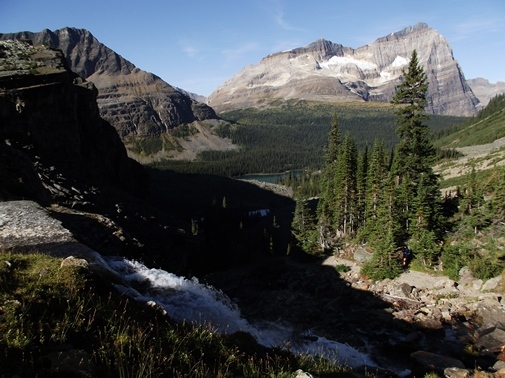 The hike to Bow Glacier Falls begins from the back side of the historic Num-Ti-Jah Lodge. 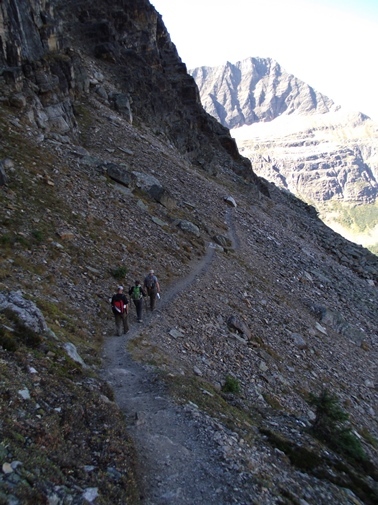 From the lodge the trail leads around the northern shore of Bow Lake, before following along the inlet stream that crosses over a series of broad gravel flats to the base of Bow Glacier Falls. Both the lake and the valley offers great views of the surrounding mountains, but smoke from dozens of wildfires limited the vistas during our hike. 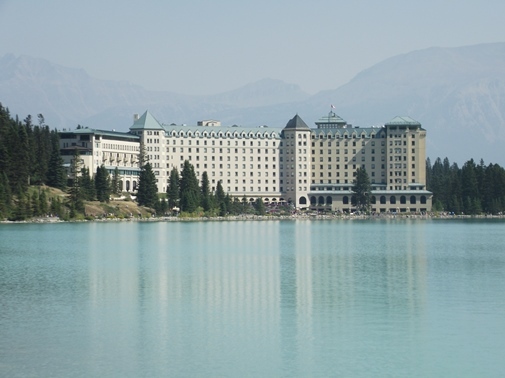 The hike to the Plain of Six Glaciers Teahouse begins from Lake Louise and the world famous Chateau Lake Louise. 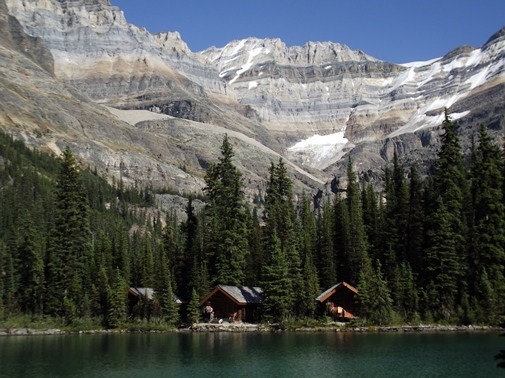 The original cabin, which stood on the same site as today’s massive chateau, was built by the Canadian Pacific Railway around the turn of the 20th century as a basecamp for outdoor enthusiasts and alpinists. Through two fires and four architects the small, one-story log cabin eventually evolved into a grand chateau. The Painter Wing, built in 1913, is the oldest existing portion of the current hotel. 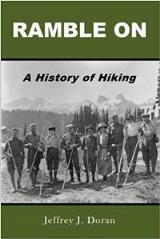 In the early days the Canadian Pacific Railway hired Swiss mountain guides to lead climbing expeditions and hotel guests into the mountains. As a result of the European influence introduced to the area, the CPR built several backcountry shelters and teahouses that reflected the Swiss chalet architecture style. 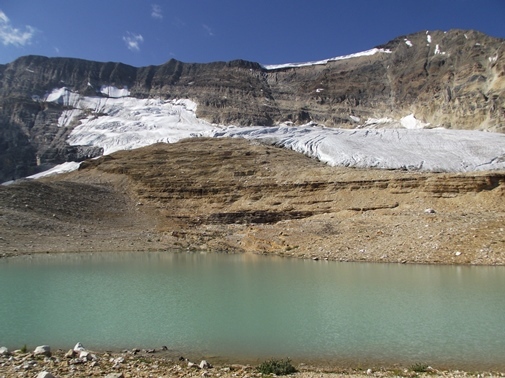 This included the Plain of Six Glaciers Teahouse, which was built in 1924. 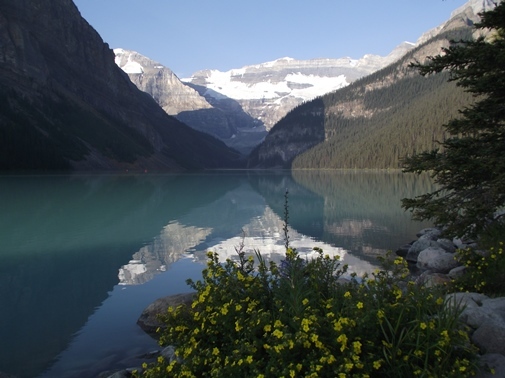 From the beginning hikers will enjoy the spectacular scenery of Lake Louise. 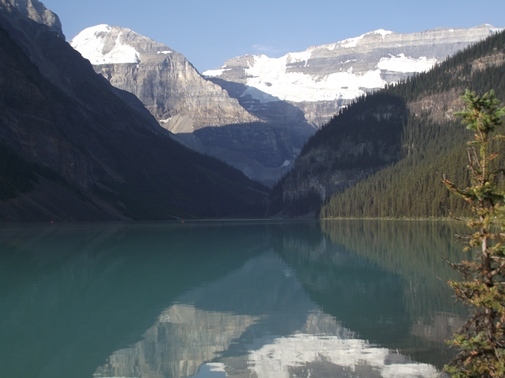 At its deepest point the lake is 230 feet (70m) deep. 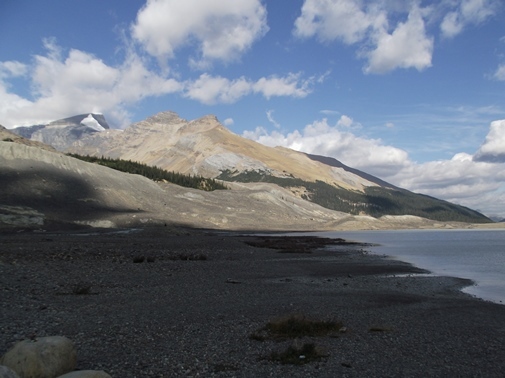 Cold Canadian winters usually results in the lake being frozen from November though June, with ice reaching a maximum thickness of 3.3 feet (1m) during mid-winter. 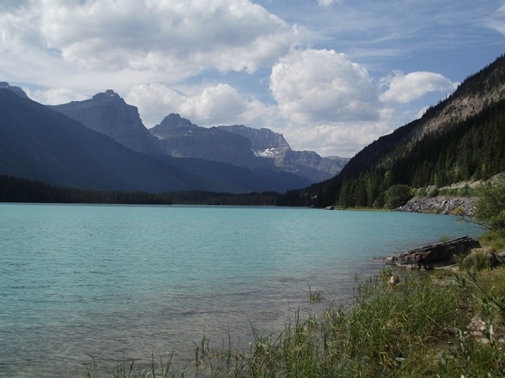 As a result of being fed by six glaciers, fine silt from grinding rock gives the lake its beautiful turquoise color. 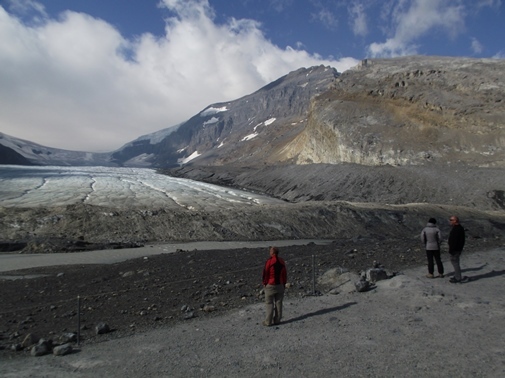 At the end of the valley is the Victoria Glacier, which once filled the entire valley. 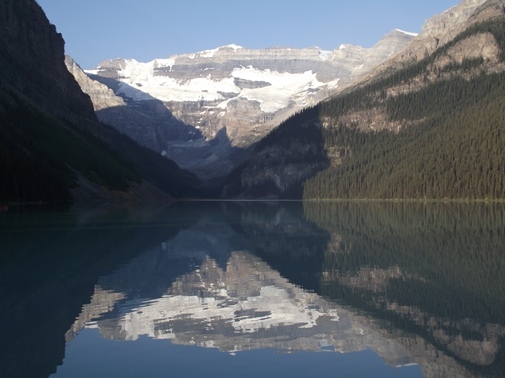 Roughly 10,000 years ago the glacier melted and left behind massive moraines and rocky debris which eventually formed Lake Louise. 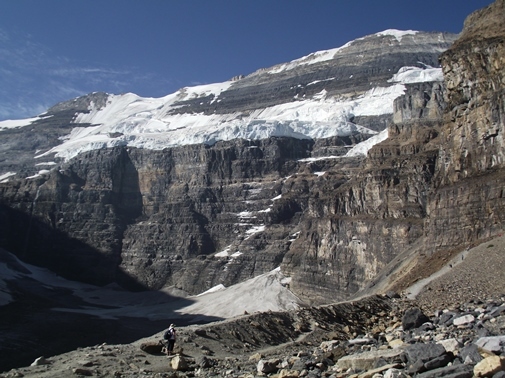 Today the glacier sits along the flanks of Mount Victoria and Mount Lefroy, which form the Continental Divide. 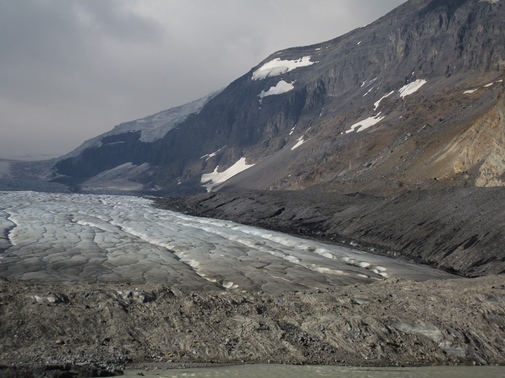 The upper portion of the glacier is roughly 262 feet (80m) thick, which is roughly twice the height of Chateau Lake Louise. After walking more than a mile along the north shore of the lake the trail begins to climb towards the teahouse. 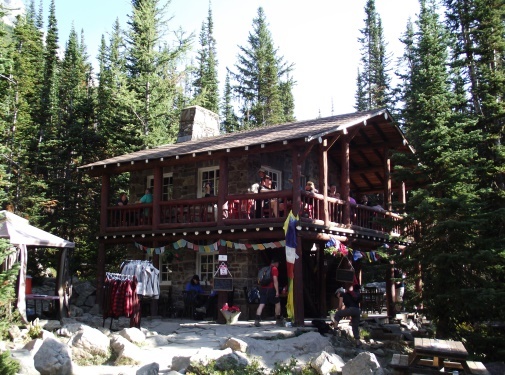 The Plain of Six Glaciers Teahouse serves tea, lemonade, soups, sandwiches and desserts. Unless you get here fairly early you should expect crowds and long waits. 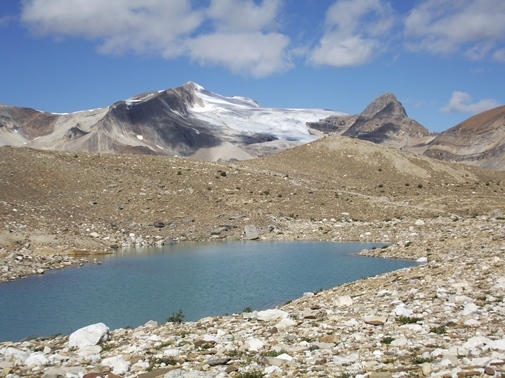 The trail continues beyond the teahouse to climb a lateral moraine which offers close-up views of Victoria Glacier and Abbot Pass, which sits between Mount Victoria and Mount Lefroy. 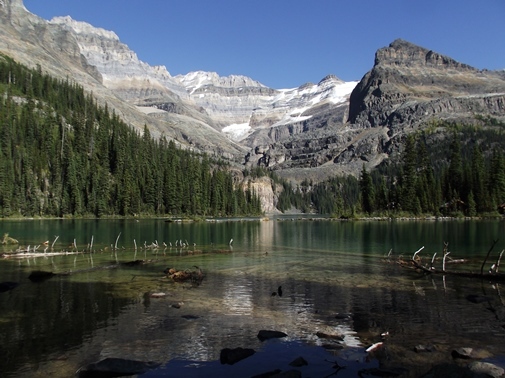 Lake O'Hara was definitely one of the highlights of our trip - if not the top highlight. 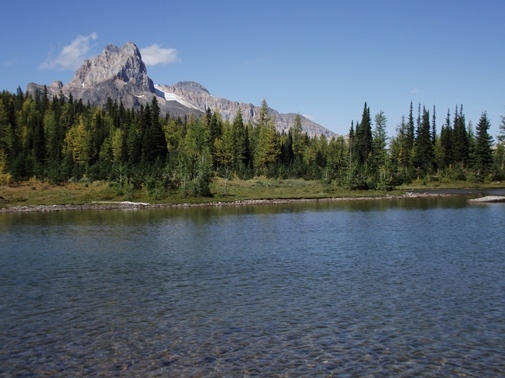 In order to keep the area surrounding the lake as pristine as possible, and to protect its fragile environment, Yoho National Park limits the number of people who can visit the area to only a few dozen each day. As such, the park forces visitors to purchase tickets to ride a bus to the lake, which is essentially the only reasonable way to get into the area. As you might expect, tickets are in extremely high demand. Reservations for the entire season go on sale in April. At the stroke of 8:00 am all four of us in our party tried to purchase tickets. This year the entire season literally sold out within 5 minutes! Fortunately Kathy was able to get in and reserve a spot for us on the last day of our trip. After all the smoky days we endured throughout our trip, unbelievably, and thankfully, our day at the lake happened to be a spectacular bluebird day. 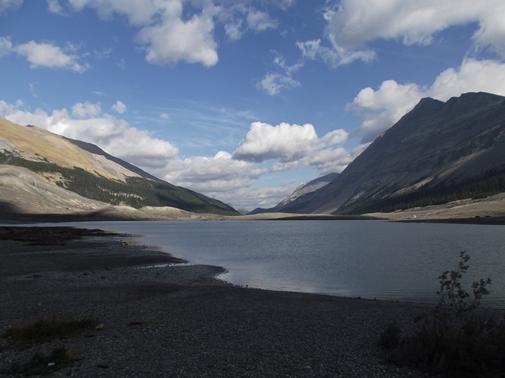 Once at the lake you’ll have several options in terms of where to hike. 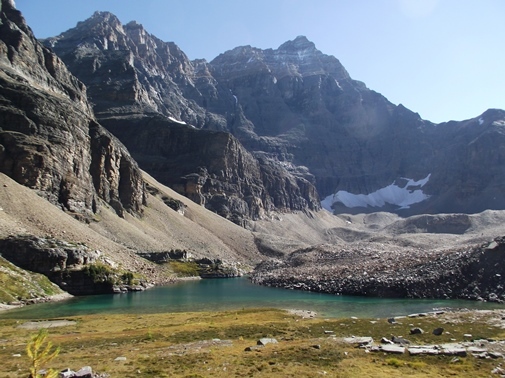 In addition to the epic scenery the area offers, Lake O’Hara is also famous for its alpine circuit, a loop hike that traverses precipitous ledges with frightening exposure to steep drop-offs. 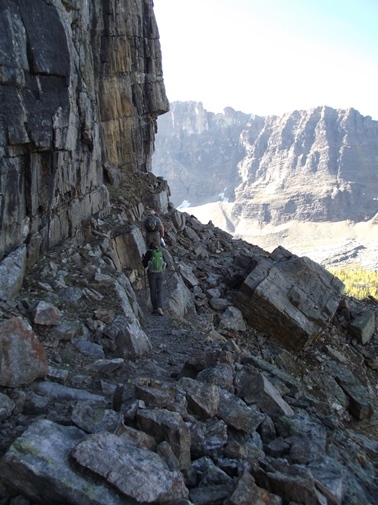 If you have a fear of heights you’ll likely want to avoid the Huber Ledges Alpine Route and the All Souls Alpine Route. 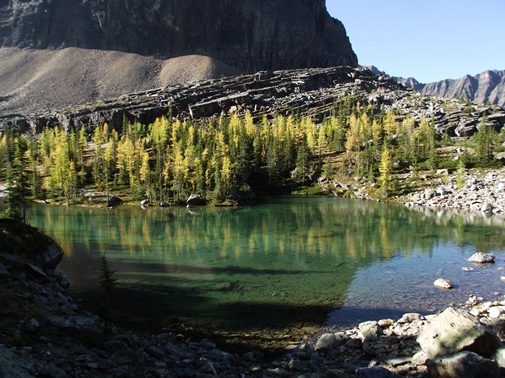 Lake O'Hara is named after Lieutenant-Colonel Robert O’Hara, who heard about the lake after being discovered by James Joseph McArthur in 1887 while surveying for the Canadian government. O’Hara, from Galway, Ireland, was likely the first tourist to visit the lake. 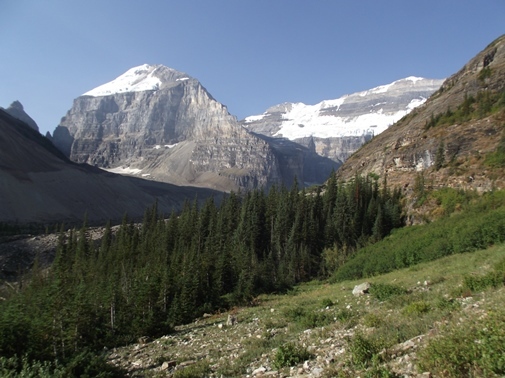 Hikers will have a couple of options with this hiking destination. You can do a 12-mile loop, which most people choose do in counter-clockwise direction. 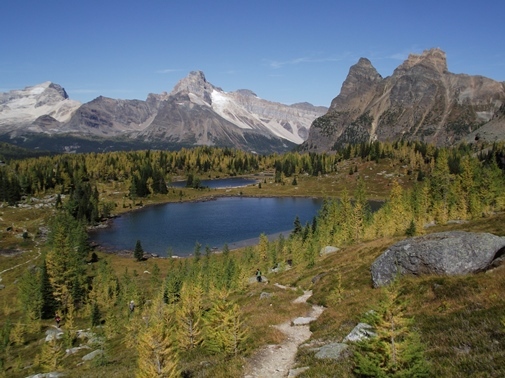 This option initially leads hikers through the scenic Yoho Valley. We chose to do the 9-mile out and back track, which took us to the highest point on the trail. This option proceeds in a clockwise direction, if you were to make this a loop hike. 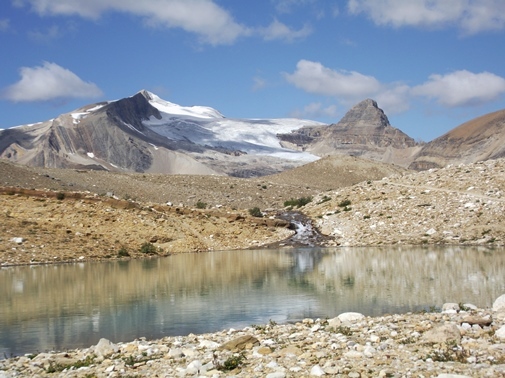 Each version of these hikes begins from the trailhead near Takakkaw Falls. Our hike began with a climb through a large avalanche path. 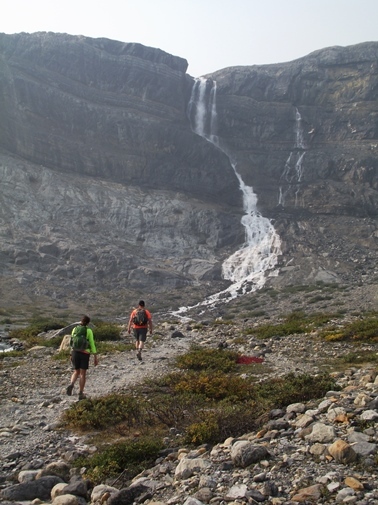 It offered birds-eye views of Daly Glacier and Takakkaw Falls for several miles along the route. 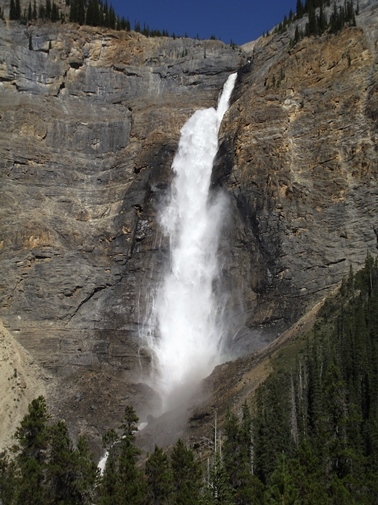 Takakkaw means “it is magnificent” in the Cree language. 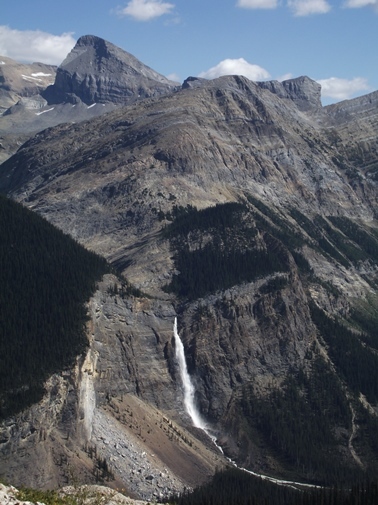 At 833 feet (254m), it’s one of the highest waterfalls in Canada. 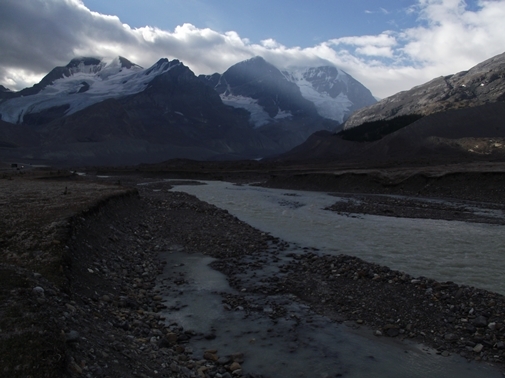 The waterfall is fed by Daly Glacier, which is fed by the Waputik Icefield above it. 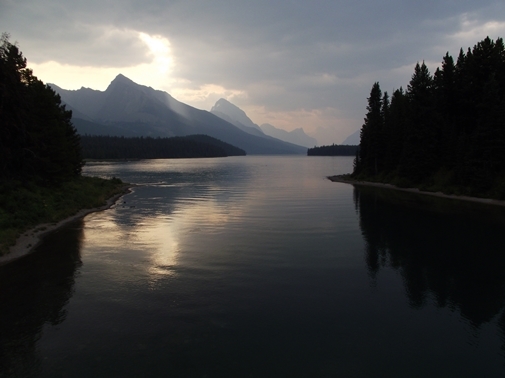 As mentioned in my post yesterday, Kathy and I recently returned from an extended trip in the Canadian Rockies. 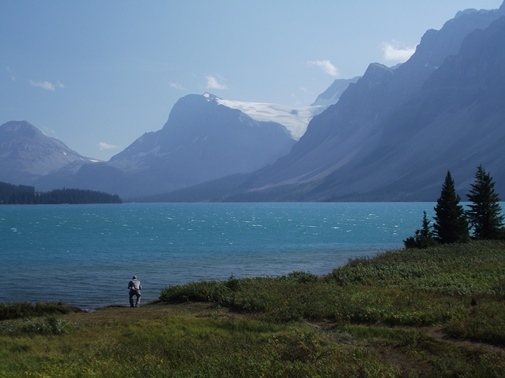 During our visit we had an opportunity to explore three national parks: Banff, Jasper and Yoho. 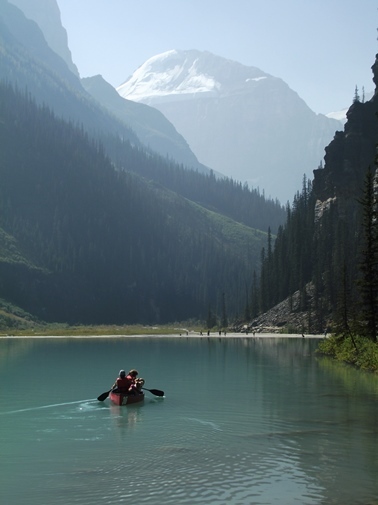 It likely goes without saying, but the Canadian Rockies are extremely beautiful. 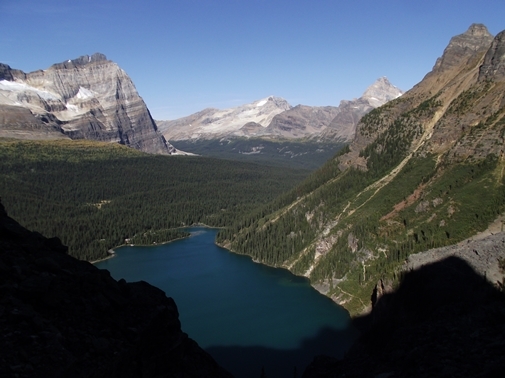 In fact, some of the hikes we took on this trip were some of the most scenic hikes we’ve ever taken in our lives. For me personally, perhaps the Paradise Valley in Mt. Rainier National Park is the only hike that would rival hikes such as Parkers Ridge, Iceline Trail, Wenkchemna Pass or Lake O’Hara. These four hikes in particular were simply epic - with scenery so incredibly beautiful that we walked in constant awe. In this posting I wanted to provide you with a few observations from our trip. First of all, I should say that Canadians are very friendly people. We really appreciated that aspect of our visit. If you're considering a trip to the region, however, you may want to note that food and lodging are fairly expensive. With the favorable exchange rate that has existed over the last several months, however, we were pretty fortunate to catch a bit of a break on costs during this trip. Trails in all three parks were extremely crowded. 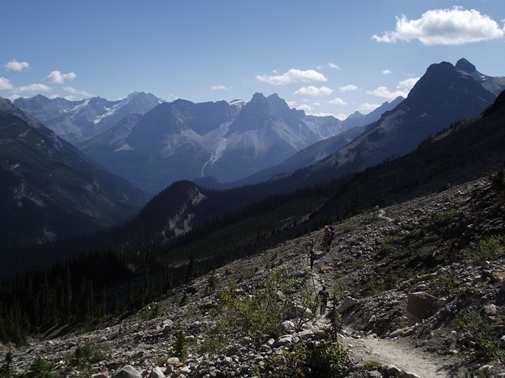 We were a little perplexed as to why there were so few trails in both Jasper and Banff. 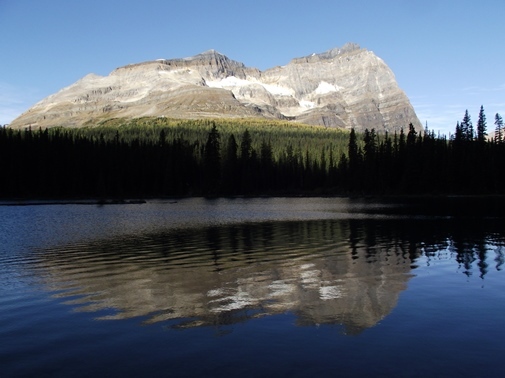 It seems that these parks could easily disperse the crowds by building more trails along the long Icefields Parkway and Trans-Canada Highway corridor, which stretches roughly 180 miles between the towns of Banff and Jasper. 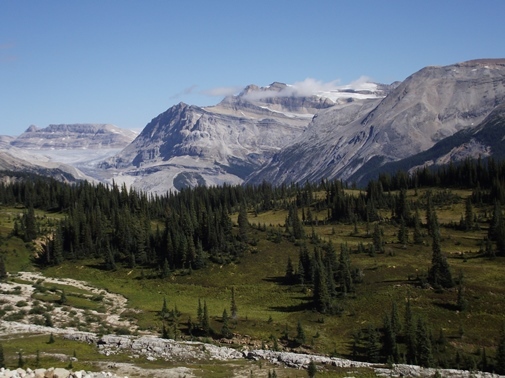 Perhaps Parks Canada is trying to keep the majority of those two parks as pristine as possible, or perhaps they find it’s easier to manage the masses that visit the parks by confining them to only a few trails. Who knows? If a degree of solitude is important to you, however, I highly recommend starting your hikes as early in the morning as possible. Our group found that road and trailhead signage was very bad, especially when compared to American parks. In some cases the signage was confusing, while in others it was simply non-existent. Several times we had to guess where the trailhead was, or where the trail proceeded. We also noticed quite a bit of illegal trail cutting on switchbacks. 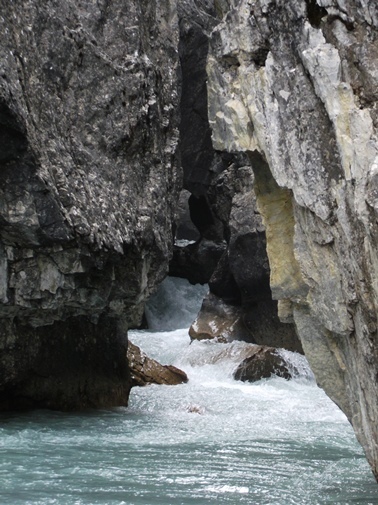 This isn’t necessarily the fault of Canadians, as there were many people from all over the world visiting these parks, many of whom looked to be new to hiking. One day near Sentinel Pass we ran into a volunteer who was asking hikers to stay on the trail and to avoid the various social trails. We were also very perplexed as to why we saw hardly any wildlife during our two-week trip in the region. Over the course of all of our hikes we saw only one golden eagle, one pine marten (a first for all of us), one marmot, one grouse, a couple of pikas, a couple of Barrow’s goldeneye ducks, and one deer standing along the road in the town of Banff. We don’t know if that’s normal or not, but we were pretty disappointed from that standpoint. That’s not to say there isn’t a lot of wildlife out there. 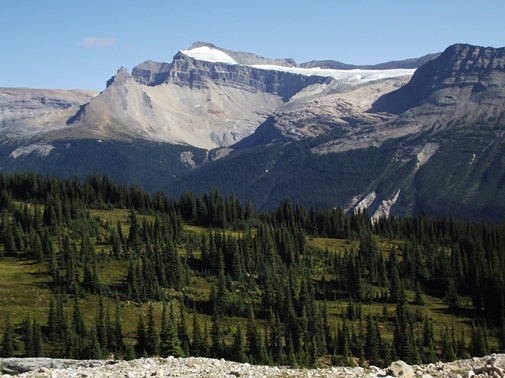 You absolutely still need to be aware that you’re hiking in grizzly country while in the Canadian Rockies. 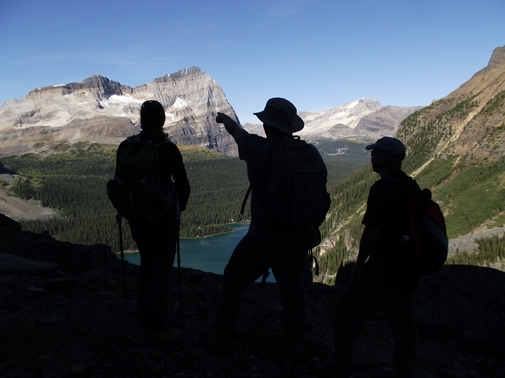 In fact, on many trails Parks Canada requires visitors to hike in groups of at least four (we visited with two other family members). Over the next several days I’ll be posting photos from our hikes. Unfortunately smoke was very much a part of our trip. 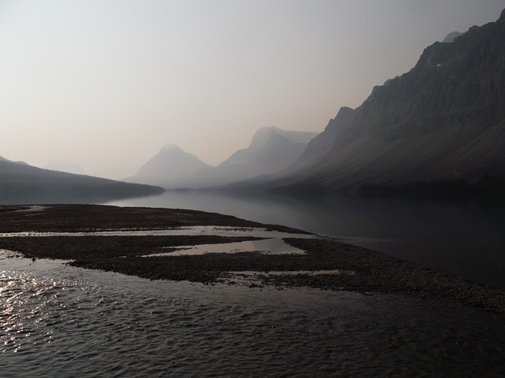 This past summer was a terrible wildfire season in the Canadian Rockies and the American Northwest, and as a result, heavy smoke filled the air throughout the region for several weeks. We knew up front that smoke was going to be a major issue. 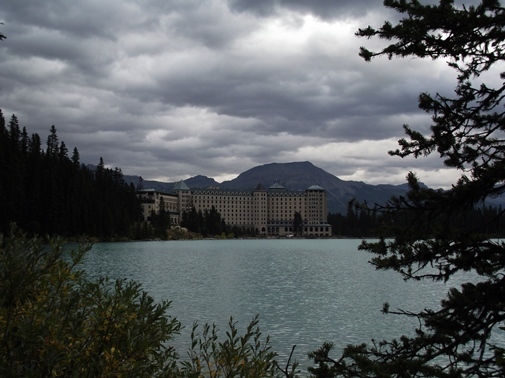 In fact, we almost cancelled the trip after looking at some of the Lake Louise webcams. Some days were sparkling clear, while others smoke completely obscured the surrounding mountains. We decided to move forward with our plans anyway, knowing the possible consequences. Although we experienced a couple of bad days and a couple of marginal days, the good days outweighed all the others. We saved the most scenic hikes for those days when smoke was predicted to be of little or no consequence. 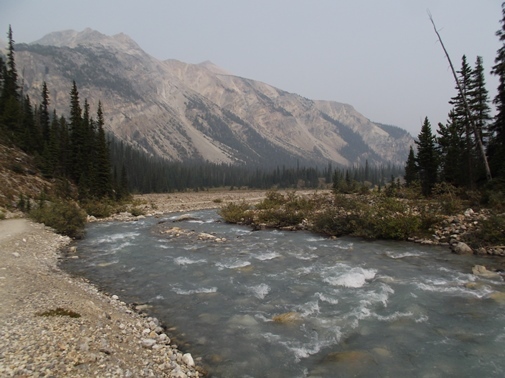 In case you're planning a trip to the Canadian Rockies someday, I wanted to mention here that there were a couple of hikes we didn’t get a chance to do as a result of the smoke. 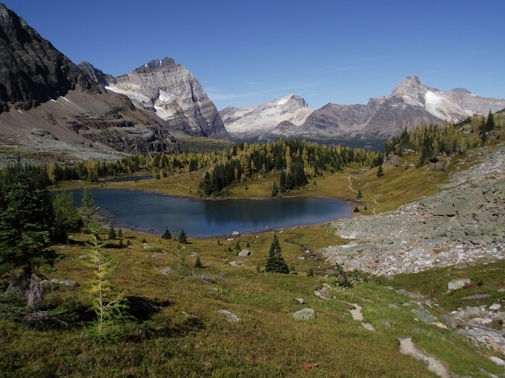 These are hikes you may want to put on your radar should you ever decide to visit the region: Edith Cavell Meadows, Fairview Mountain, Wilcox Pass and the Emerald Lake Triangle, which includes Yoho and Burgess Passes.